He was howling at the moon..."
A shaman is something like a wizard or witch doctor. As a religion, shamanism holds that good and evil forces can be influenced through the work of the shaman. On the end of a silver spoon..."
I'm not an expert on this and have no first hand experience, but I believe heroin is heated in a spoon prior to injection (this should not be construed as a recommendation). DzM also wrote to point out that sometimes cocaine is snorted off a spoon at those times when mirror and razor blade aren't accessible or acceptable. That's where he came to me..."
Primrose Hill is a garden located in Lucan, Co. Dublin and, as beautiful as it is, it is easy to imagine God appearing there (if one believes in such things). But given Shane's departure from the band at this point, it probably refers to Primrose Hill in London, which was once part of the same hunting forest as Regent's Park in the Hampstead section of the city. Primrose Hill also played a significant role in a murder case back in the "restoration" phase of the English monarchy involving a plot to murder Charles II so as to reinstall the Catholic James I as king. "The bats are in the belfry..."
Someone with "bats in the belfry" is considered mentally ill in a mild sort of way (slightly loopy in other words). It's also the first line in Tom Waits' "Innocent When You Dream" (from his Frank's Wild Years release; thanks to Hoddle for the heads up). The secret of the universe is hidden in this song..."
And damn if I can find it anywhere. Great lyric though. Not much really to put in here, it's just that I really like T. Woods' writing and I'm a bit depressed that this was his swan song with the Pogues. At any rate, the spooked tree also shows up in "Sit Down by the Fire." The "Lord's Prayer or "Our Father" is a standard Catholic prayer (one of the two -- the other being a "Hail Mary;" click the link to open a window with the full prayer) usually doled out as penance upon confession. Also, the lyric sheet reads "peddled," which would mean to sell something rather than "pedaled" which would mean to propel the bicycle. I suspect it was just sloppy editing by the folks at the record company (thanks to Leon for catching that). Here's some thoughts from Jem about this tune: "This started off as an attempt to write a song for Rod Stewart! It retains that Faces swing ..."
The title and overall theme of this tune probably come from the poem "Le Bateau ivre" ("The Drunken Boat") by French poet and author Arthur Rimbauld (1854-1891; thanks Tom for the heads up). It's a pretty lengthy work so I didn't reproduce the full poem here, but the two links provide the French original and an English translation, with the English site also providing a biography. Composed when Rimbauld was but seventeen years old (! ), the poem became quite a sensation on the European continent, inspiring several generations of writers. We'll see monotliths and bridges and the christ up on the hill..."
The lyrics list "phospor," but it's probably a typo for "phosphor, " which, at least in poetic contexts, refers to the planet Venus when it rises in the morning before the sun. More to the point here, it is a poetic contraction for "phosphorescence." As Joe wrote to point out, when a ship travels through the water it generates a bow wave, which, if the seas are right (that is, moderate to heavy wave swells), creates a huge area of foam surrounding the ship (click here for a pic; thanks Joe). Sometimes this breaking wave of foam can be illuminated by the presence of bioluminscent creatures in the water. In the old days sailors believed it was caused by phosphorus in the water. Macao is an island off the coast of southeastern China at the mouth of the Canton River (just opposite Hong Kong) and was the first European (via Portugal in the 16th century) settlement in the Far East; Acapulco is a port in Mexico (on the Pacific side), Havana is in Cuba on the Gulf of Mexico, and Seville in southwestern Spain (at the mouth of the Mediterranean). 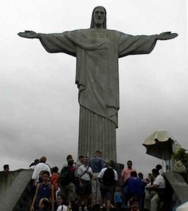 There's a mammoth (236 foot) statue of Christ on Corcavado Mountain overlooking Rio de Janiero in Brazil. Rio itself is a port city located in the Southern coast of Brazil. The pic on the right is the view from the sea, the one on the left the statue up close. French makes no distinction between dusk and twilight (in english, dusk usually has the connotation of coming closer to the dark side of twilight merging into night), so "crépuscule" could mean either "twilight" or "dusk" (I've usually seen the word rendered as "twilight" in most translations). "We sailed through constellations and were rutted by the storm..."
This may be a stretch, but here goes. In most animal species, including most mammals, females are receptive to the sexual advances of males only at quite specific times of the year (i.e., when they are "in heat"). When females reach that point of the estrus cycle they release pheremones -- chemicals that work via the olfactory sense to trigger the release of neurotransmitters in the brain -- which, when received by the males, causes a reaction which drives them to pursue the female. This is called "rutting." So to be "rutted by the storm" would cast the ship in the role of the female with the storm in hot pursuit, come hell or high water so to speak. Great imagery if my read is right. As a side bar, note that the human species is one of the few exceptions to the cycle described above (our close genetic relatives, the bonobos, are another). Although this may come as a surprise to some married folks out there, human females do not have an estrus cycle and as such are receptive to sexual advances throughout the year. Some evolutionary psychologists and sociobiologists have speculated that this provides insight into the origin of the family and the sociality of the human species. That is, for human beings and bonobos, sexual activity has importance far beyond its obvious reproductive necessity. "With the wainscot our horizon and the ceiling as the sky..."
The "wainscot," usually rendered as "wainscoting" refers to that strip of wood that runs along the wall of a house where wall meets floor; sometimes referred to as the baseboard here in the States. The term derives from a type of oak from Russia, Denmark, and Germany. There's a classic Monty Python skit (in Episode 20) with Graham Chapman as a rat catcher killed after being summoned to a house infested with what turns out to be gun-toting sheep residing in the wainscoting: "It's an entirely new strain of sheep, a killer sheep that can not only hold a rifle but is a first-class shot"). "We dreamed that whole Leviathans lay rotting in the reeds..."
But all below it signifies is a ship's gone in the drink..."
We have two different superstitions at play in this verse. The first and third lines refer to the belief among sailors that it is a bad sign if the ship's bell rings of its own accord: the ship is doomed (it will sink, or in other words, go "in the drink.") The second line refers to the folk belief that whenever a bell rings it signifies that an angel has "earned his wings" by doing a good deed somewhere on earth (you might remember the bar scene in "It's a Wonderful Life" where George Bailey [played by Jimmy Stewart] and Clarence [his guardian angel] get tossed out after Clarence, upon hearing the cash register ring, mentions that it means an angel has got his wings). Wadi Hammamat was an ancient road (still in use today) in Egypt, running from the town of Gebtu to the Red Sea. So the girl from the Wadi Hammamat would probably be Egyptian. Across the dunes Khamsin Khamsin..."
The Khamsin are hot winds that blow in from the southwest in Egypt during the spring and last for about fifty days. On a personnel note, David Coulter plays percussion on this tune (as well as others on this cd), and he eventually became a full fledged member of the last incarnation of the band, the one that released "Pogue Mahone." Here's a brief extract from an interview where he discusses how he came to hook up with the band. "Tell me about your six years with The Pogues. How did you get into that and out of it? What made your music evolve the way it has? I had always been a fan since my college days. My brother Mark and I would get falling down drunk on Guinness and Jameson's and enter into the fray. He'd dance. I'd hold on to the wall and listen to this raw, hard, frantic pure energy. McGowan [sic] was good then. Before he lost the muse. I then met them in a hotel in Turin. Jem (Finer) and I really hit it off and traded knowledge. He was fascinated by the didjeridu and the breathing techniques, etc. I was riveted by the unexplored sound field that is the hurdy-gurdy. We became friends and after a while it just kind of happened. If they were doing a gig and I was around, I'd pitch up with the didjeridu and a bag of tricks and just piss out my territory, so to speak. Eventually, Terry Woods left the band and I filled the mandolin shoes. I also continued the odd bit of didjeridu live with them and added the fiddle, bits of percussion, the odd accordion tune. I played on two albums, Waiting for Herb & Pogue Mahone and toured all over the place. It was an ambition fulfilled. Rough and smooth. Lots of good bits. Some bad bits, too. I don't drink any more! How did I get out of it? The same way as most people... The Pogues threw in the towel on 26 July 1996. RIP. There'll probably be a reunion when McGowan [sic] croaks!" You can find the full interview here. Happily (at least for you folks in the UK and Ireland) the band did reunite for a stint of shows around Christmas, 2001. Here's some thoughts from Jem about this song: "In his book The Songlines, Bruce Chatwin mentions a Sudanese camel-man who 'as he walked, he sang: a song, usually, about a girl from the Wadi Hammamat who was lovely as a green parakeet.' Andrew (Ranken) and I often talked about writing the rest of the song. After a few years of speculating as to what exactly that might be, he gave me the lyrics." Pachinko is a very popular form of gambling in Japan (although gambling per se is illegal). It involves a pinball type machine where the patron purchases a certain number of balls to use in the machine. The basic premise of the game is to shoot the balls up into the machine and have them bounce off the pins and into scoring slots (which pay off with more balls). At the end of the day, you get to "cash in" any surplus balls for prizes and other goodies. Here's a few words from Jem about the tune: "The first time I went to Japan I wondered what Pachinko parlours were. The second time I went in one and tried to play ... but was hopelessly lost. The third time I bought a book on how to play but still made little headway. The fourth time an old Japanese man came and stood by me. He rested his hand on mine and subtly guided me to the jackpot .... 'uchi domi. Pachinko, lest you don't know, is a Japanese variation on pinball. Pachinko parlours are wonderful halls of noise and light with aisles and aisles of machines." Roppongi is a section of Tokyo with a reputation for catering to western visitors. There are two basic types of pachinko: hanemono and deji-pachi (which is a contraction meaning "digital pachinko"). In deji-pachi machines the payoffs are controlled by a computer and look a bit like the slot machines in Vegas, Atlantic City, or your local Native American gambling hall. When a particular winning combination of numbers appear on the machine, the machine enters "uchi domi" or "fever" and it becomes easier to win. In the older hanemono machines, when the player lines the balls up in particular slots,"wings" open that funnel balls into a central area, and if a ball hits a specific point in the central area, then the machine goes "uchi-dome," the wings open repeatedly, and it's easier to win big. For what it's worth, I really really hate this song. In my personal opinion, it is the worst thing the band ever recorded. There, I feel better now. Sorry Jem. Prior to the recording sessions for this album, Ranken's wife died during childbirth. So while the song may not specifically refer to that incident, it probably is part of the backdrop to the song. Click here for an interview with Spider where he relates the incident (scroll down about halfway through the interview). Ranken's "Four O'Clock in the Morning" describes the tragedy much more graphically. Thanks to Juan and DzM for the info.